The CAA Annual Conference is the world’s largest international forum for professionals in the visual arts. 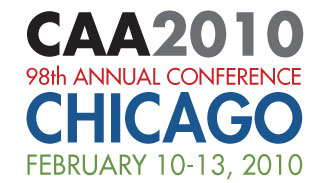 More than four thousand artists, art historians, curators, educators, and students are expected to meet February 10–13, 2010, at the Hyatt Regency in Chicago. The conference website, which contains registration information, travel and hotel details, Career Services features, reception and meeting listings, special events, and more, was launched yesterday. The conference website expands on the 2010 Conference Information and Registration booklet that will arrive in members’ mailboxes later this month; new material and information will be added regularly between now and February. Listings of session titles and chairs are also available on the conference website. Full session details, including the names of panelists and their paper titles, will be posted soon. Online registration opened yesterday. You can also buy tickets for other events, such as the Gala Reception, professional-development workshops, and postconference tours. Alternatively, you may use the printed forms in Conference Information and Registration. CAA was able to renegotiate cheaper hotel rates at the Hyatt Regency Chicago, the headquarters hotel, to help save conference attendees even more money. See Travel & Lodging on the conference website for full details.